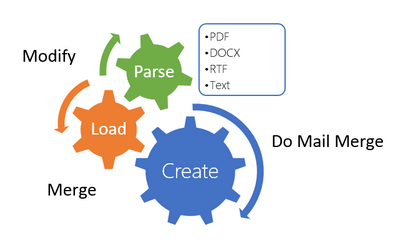 «Document .Net» will help you in development of applications which operates with DOCX, RTF, PDF and Text documents. After adding of the reference to "SautinSoft.Document.dll" (it's 100% C# managed assembly) you will be able to create a new document, parse an existing, etc. We are developing .Net components which help your applications to create, parse, modify, convert HTML, RTF, Word, Excel, Text and PDF documents. «Document .Net» will help you in development of applications which operates with DOCX, RTF, PDF and Text documents. After adding of the reference to "SautinSoft.Document.dll" (it's 100% C# managed assembly) you will be able to create a new document, parse an existing, modify anything what you want. Created in 100% managed C#. Has own DOCX parser and renderer according to ECMA-376 specification. Has own RTF parser and renderer according to RTF 1.8 specification. Has own PDF parser according to PDF reference 1.7. I can select a desired edition from: Total, DOCX and RTF. This saves my money. Let's us say, that I'm looking for only the API to create or parse DOCX and don't need other features. Given this point, I can purchase the "DOCX" edition of Document .Net. It's much cheaper than competitor's price. Requires only .Net 4.0 or above. Our product is compatible with all .Net languages and supports all Operating Systems where .Net Framework can be used. Note that «Document .Net» is entirely written in managed C#, which makes it absolutely standalone and an independent library. Of course, No dependency on Microsoft Word.